Made by the spanish company Rotor, the Agilis crankset will be part of the « Cervelo Test Team » 2009 equipment, where is his leader Carlos Sastre, winner of the last Tour de France.The team announced that its goal is to take advantage of professional cycling and some cyclists’ experience like Sastre to improve sponsors’ equipments… it sounds good. So, we have tested this crankset coming along with its SAAB bottom braket (self aligning bracket bearings, already presented on the website) and with the famous oval chainrings, tested here. This crankset is made through a « Hollowminium Technology » which is a process using a CNC machined alloy to maintain stiffness, strength and low weight. 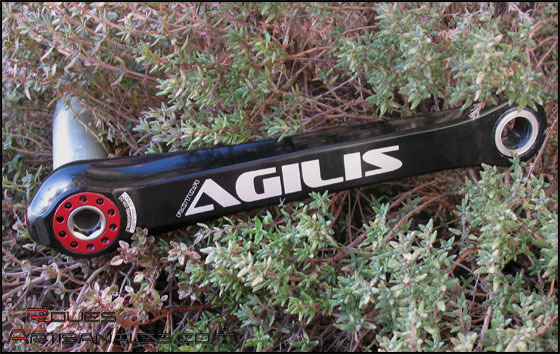 The Agilis hit the scale with 502grams in a classic double version. This weight gain is due to the lightened spider and hollow cranks/axle. The bottom bracket bearings are in ceramic and the chainrings are machined down from 7075 CNC alloy. Total weight is 738grams with 52-39 chainrings. Aesthetically speaking, the cranks look beautiful and classy. They look completely different from what we are used to with the modern standards, they are very thin but the crankset keeps a very modern look thanks to the big white letters and the red screws. Unfortunately Rotor doesn’t propose other screw colors to match the bike. This is certainly a way which deserves more attention from Rotor. The crankset works with the same bearings as Shimano, FSA… This is a good thing for those already using this standard. I usually ride with a Campagnolo Ultra Torque, the first operation was to change my Campagnolo cups to install the Rotor bottom bracket which is very smooth in hand. operation to tight it up is done through a 10mm hex key. The same system is present on the left side but it is only here to fix the play or to free the bearings. It’s a preload system. It is highly advised to check the screw torque after some rides to prevent play or noises from appearing. If you want to use the Rotor Chainrings, you will need to rise your front derailleur. What’s up on the road? On the road, this crankset performed pretty well. We have a few criticisms about it. The bearings are very smooth, and the cranks are very rigid, almost on par with the Campagnolo Record Ultra Torque or Shimano Dura Ace 7800. We have to mention that they felt flexier than the two previous we quoted though. We felt some deviations of the cranks/chainrings on the 52-11 when standing on the bike and pushing hard the pedals. This sensation didn’t appear anymore then. We probably got used of the lower stiffness standard. 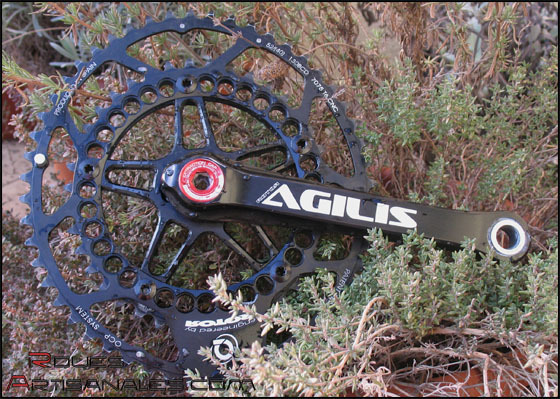 Although this crankset is not the lightest, nor the most rigid, it remains in the upper middle of the market and has an excellent weight to rigidity ratio. This component will satisfy those looking for non standard materials having an excellent value for money.